In what will (very) hopefully be the first of many such announcements to come in the months and years ahead, Mayor Mike Duggan held a press conference in the city’s Fitzgerald northwest Detroit neighborhood near Livernois and McNichols this afternoon to announce a $4 million investment designed to turn the community around within two years, which is close to breakneck speed. The struggling square quarter-mile area currently is defined by 131 vacant homes, 242 vacant lots, and more than 600 very determined families – some of whom were on hand at the announcement – who never left. Maybe because they couldn’t, maybe because they wouldn’t, but they stuck it out. And now, finally, it looks like some long-deserved help may be coming their way. For years now, Detroiters have been hearing about all the wonderful things going on where most of them don’t live and can never afford to live, namely downtown and Midtown. Nothing against either of those communities because they are a welcome part of Detroit too, and it’s great they’re doing so well. But since more than 90 percent of the residents of this city don’t live there, the visible frustration was more than understandable. But to Duggan’s credit, it’s not like he’s been sitting there in his office ignoring the neighborhoods for the past four years. Granted, critics will rapidly point to the fact that this neighborhood improvement rollout comes at a particularly and politically opportune time since he is running for re-election in the fall. But if his administration had not been laying the groundwork for the changes we’re about to see in coming months and years (assuming he wins re-election), then he wouldn’t have anything to show. I always say one of the best ways to judge a person is by who they surround themselves with, and if Director of Planning and Development Maurice Cox is any indication then that says a lot in his favor. Cox was hired by Duggan specifically to light a fire under neighborhood redevelopment, and in a relatively short period of time he has made an impressive amount of progress. If this continues, the Detroiters who have stayed in Detroit and kept it afloat through all these tough times, enduring the slings and arrows of sneering outsiders, will finally begin to receive the amount of love and attention that the vaunted newcomers have been receiving just for showing up. Granted, one square quarter of a mile in a city the size of Detroit is not exactly taking a huge bite out of the problem. But perhaps it’s best to move ahead at a manageable pace and get it right rather than race ahead and leave too much cleanup behind. “Urban revitalization in this country for years has meant you move out the people who are there and you build something new. In Detroit, we’re doing just the opposite. We’re doing neighborhood revitalization to keep the neighbors here who have stayed here through the tough times and improve the quality of the neighborhood,” he said. Duggan also praised developer David Alade and the Fitz Forward LLC Team who won the bid to build this project. Contrary to the image promoted by those understandably afraid that white developers are coming to steal Detroit away from beneath their feet, Alade is a young African American man who appears to have a clear passion for helping to redevelop Detroit for Detroiters. According to a press release handed out at the event, Fitz Forward is led by developers Century Partners and The Platform. Century Partners was co-founded by Andrew Colum and Alade. Duggan emphasized to the assembled crowd what the planned investment will mean for the neighborhood. “Here’s what’s gonna happen; those 131 abandoned houses? Sixteen of them are gonna be knocked down because they’re not salvageable, 115 are gonna be renovated, and families are gonna move into this neighborhood. We’re gonna have rental properties, we’re gonna have home ownership, we’re gonna have a mix of affordable and market rate for 1st time homebuyers. “One hundred and ninety-two of the vacant lots are going to the Fitz Forward team, “and they will be wholly responsible for clearing those lots, planting gardens, and other improvements including maintenance. “Fifty of the lots will go to the City, which will create Ella Fitzgerald Park. And there’s going to be a quarter-mile green way running from Marygrove to U of D Mercy with a bike path and a walking path,” he said. Assuming the project receives approval from City Council, the park will be complete by the end of this year, said Duggan. By next spring the bikeway will be complete, and within two years the requirement is that all of the houses must be renovated and occupied. “Within a two year-period 100 new families will be joining you,” said Duggan, adding that the second phase of the project will bring in an additional $6 million in investment to spur development of a commercial corridor. 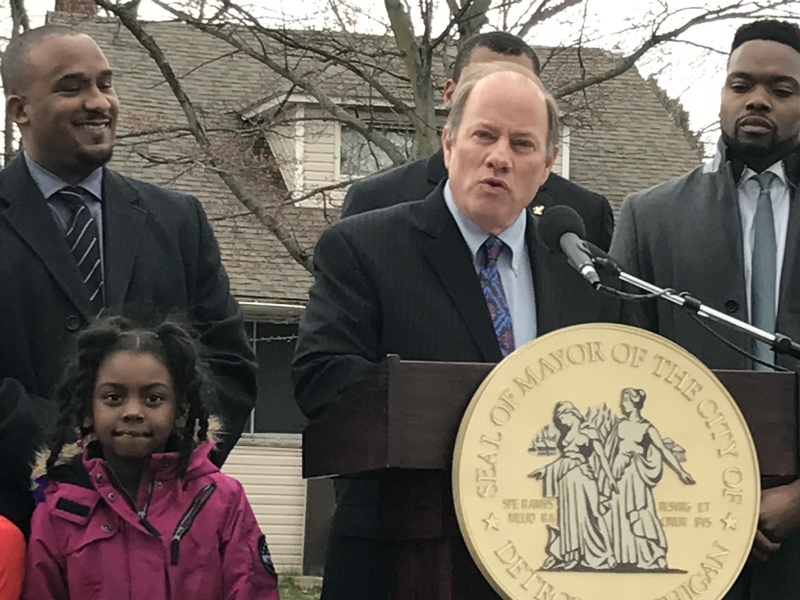 Duggan also hopes to work with whoever becomes the new DPSCD superintendent to have a public school located in the neighborhood. Cox said that the Fitzgerald project kickoff “is a day that we’ve been waiting for for a very long time.” He said that his biggest challenge coming to Detroit from New Orleans was where to start, because so much needed to be done. He was even warned that the challenge may prove too daunting. Ronnie Jones is a longtime neighborhood resident who helped clear roughly 70 lots prior to the press conference along with 7 other neighbors. He said he is happy to see what is happening now. “I look back on this neighborhood and see how it was and see how it is now. This neighborhood, it was really messed up. [Today] it feels good to walk outside my house and see that the community is helping out now, and keeping the neighborhood stable like it is now. I’m happy to see these young kids are excited to come outside of their house now. Stephanie Harbin, president of the San Juan Block Club, strongly echoed Jones’ enthusiasm with remarks that bordered on evangelism.